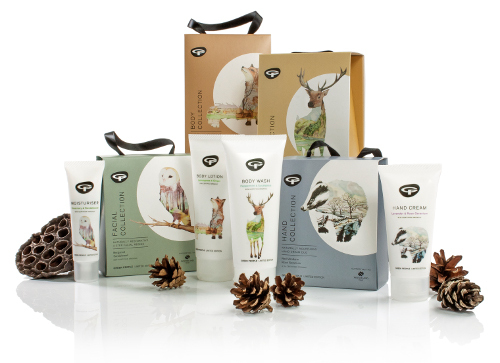 One of our favourite natural skin care brands – Green People – has recently partnered with the Woodland trust, producing beautiful gift sets packaged in lovely gift boxes featuring woodland animals that the trust works to protect. For every gift set sold, part of the proceeds will be donated to the charity so they can continue their conservation work. There are four gift sets available – Facial Collections, Body Collection, Men’s Collection, and Hand Collection – each containing natural and organic cosmetics made with plant derived ingredients that will leave your skin feeling smooth and refreshed with absolutely no chemicals. Green People is a brand that is passionate about high quality, ethical skin care that will not irritate sensitive skin or cause uncomfortable skin conditions to worsen. That’s why you’ll never find any parabens, SLS, phthalates, petrochemicals, alcohol or synthetic fragrances or colours on any of Green People’s ingredient lists, the same lists that won’t have any ingredients tested on animals. Green People are certified organic by three different bodies, so you know that this is the ultimate in environmentally friendly skin care. But back to these beautiful gift sets, the Facial Collection is illustrated with a stunning barn owl and includes organic moisturiser, cleanser and exfoliator made with natural ingredients for a glowing complexion. On to the Body Collection that features a serene fox and contains exotic body wash and body lotion for extra nourished skin. You’ll find a tall, proud Stag illustrating the Men’s Collection which holds two body washes with different scents. Finally, the Hand Collection features a charming badger and includes two hand creams that will hydrate and protect hard working hands. With Christmas fast approaching, these are some great gift ideas for loved ones. The Woodland Trust campaigns to protect the UK’s ancient woodlands whilst restoring those that have already been damaged and creating new native woodland with the help of communities, schools, organisations and individuals. We can think of a more worthy cause for Green People to support! Read more about Green People here, and don’t forget that right now you can save 15% on the whole range. Next story Feminine hygiene – why make the switch to organic?